Thanks to you our 2017 Chip In For Kids Charity Golf Tournament at the Farmers Insurance Open was a huge success! 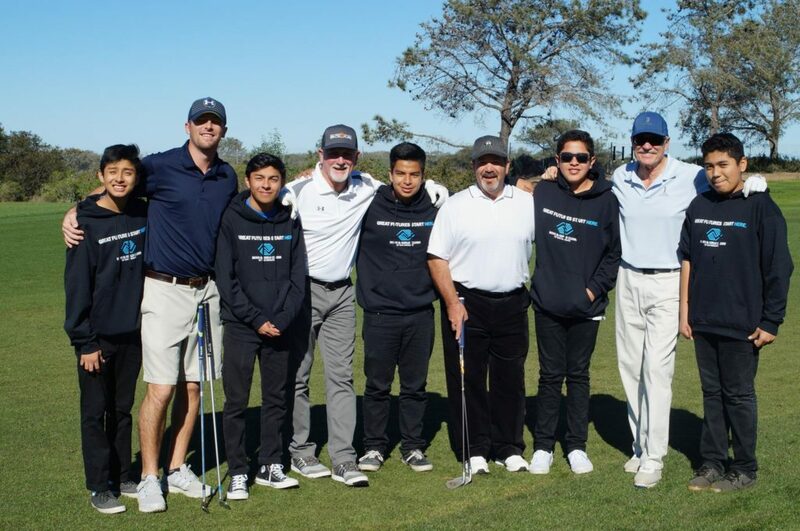 Thirty two foursomes made a remarkable showing by helping us raise over $90,000 to further our mission: providing positive after-school programs & summer activities to develop the education, health, self-esteem & character of the over 10,000 youth we serve annually. Held on Sunday, Jan. 29, the day turned out to be one that will remain in our hearts and minds as one of the best days ever! With a new North Course, amazing Torrey Pines ocean views, a swanky VIP tent and the PGA tournament a buzz with excitement, The 75 degree weather and oh so slight breeze enabled a golf experience of a lifetime! Congratulations to HP sponsored foursome: Bill Avey, Shane Wall, Steve Smith & Phil Soper for coming out on top of a 3 way tie at 114. (Ultimately decided by a back 9 cardoff). Pat Lenihan, Mike Hoeck, Rod Evans & Hack Adams were right on their tail by one stroke while Latham & Watkins Craig Garner, Kevin Reyes, Jon Klassen & Lionel Deschamps rounded out the tiebreaker. A BIG thank you to Presenting Sponsor HP represented by Ron Coughlin & Tara Agen. Also to Callaway Golf & Callaway Golf Apparel for the amazing putters, jackets and prizes! Shout out to Boys & Girls Clubs of San Dieguito long time supporters & Board Members Cory Grant & Doug Regnier for taking the lead as Co-Chairs this year. Our golf tournament depends on strong, driven committee members to help recruit sponsors, participants & product. For more information on how you can help keep this tradition alive, please contact SuLynn at sdaugherty@bgcsandieguito.org. Our organization depends on donations of all types: funds, resources and time. For information on how you can further your involvement in supporting our children, please contact our CEO Marineke Vandervort directly at 858-755-1592 to tour one of our clubs: seeing really is believing! For over 50 years thanks to support like yours, Boys & Girls Clubs of San Dieguito has been able to provide a safe, supportive & substantive environment for children to learn & grow in despite their families’ financial ability. To view golf tournament photos, our calendar of “fun” raising events & for the most up to date information on how you can have a direct impact on our youth and our organization visit www.bgcsandieguito.org OR www.facebook.com/bgcsandieguito.